Restore and protect damaged hair with this intensive leave-in milk. 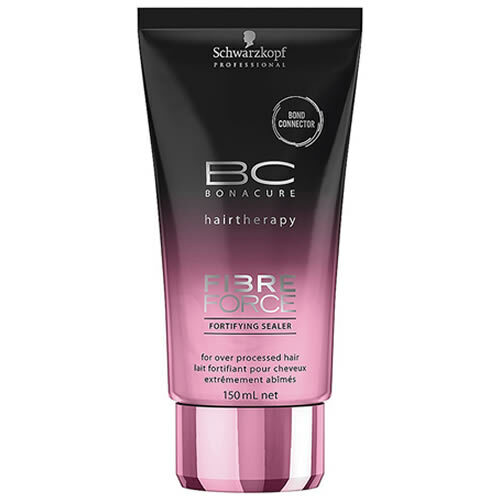 Schwarzkopf Professional BC Bonacure Fibre Force Fortifying Sealer has an advanced formula that aims to seal the cuticles of the hair and create a protective shield around the strands. A leave-in treatment, it defends against frizz and even provides colour and heat protection. It's a sealer that will restore hair and leave it rejuvenated and stronger than before as well as beautifully shiny. Simply massage it into mid-lengths and ends of your clients' towel-dried hair and comb through. Leave in and style as normal. A rich, intensive mask treatment for weaker hair that will revitalise, strengthen, renew and refresh your clients' locks. Comes in a 150-ml pot.